The Recession hit. And it hit hard. And now that it’s over, many people, economists and politicians, are wondering when the jobs are going to come back. Heck, look at the recent election for proof that current conditions are brutal. Don’t think that the surviving Democrats aren’t mindful of where we are and where we’re going. And the current dilemma? Unemployment benefits are going to expire for many folks pretty soon. 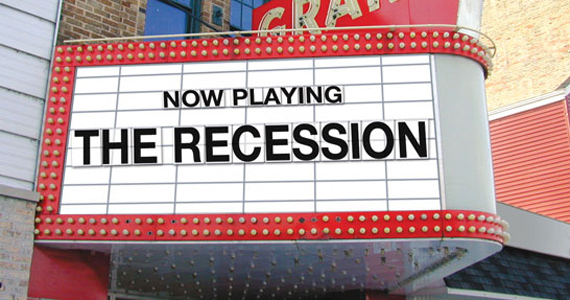 As the recession deepened, Congress acted by passing an extension of unemployment benefits. What was a normal period of 26 weeks has turned into 99. The problem will worsen sharply this winter, as the bulge of 5m workers who lost their jobs in the months after the financial meltdown of autumn 2008 notch up 99 weeks of unemployment. And in April, the emergency benefits all expire anyway. A lot of people are going to find themselves with out that weekly check. And THAT is a scary prospect. On one hand, there is the very normal and noble concept of extending the benefits. It would be cruel indeed to force people to lose benefits even as the job market continues to under perform. Removing even that meager safety net at a time like this is inhumane to say the least. On the other hand? Well, the data suggests that extending benefits doesn’t help people at all. It simply extends the amount of time that they look for a job. Only by ending those benefits will folks take that new or next job. 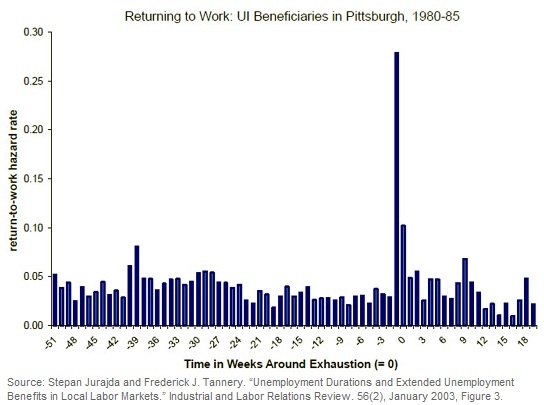 Very few people started working during the two to three weeks prior to the exhaustion of their unemployment benefits (weeks “-3″ and “-2″ in the chart). But almost 30 percent started work just a week later (19 percent started a new job, 10 percent returned to a previous job). As people faced losing their benefits in weeks, the bottom axis, never did more than 10% of the unemployed population take a job. Only when the benefits were set to expire did they take that work. Further, the story is the same in Denmark, where recently the government reduced unemployment benefits from 4 years down to 2 years. 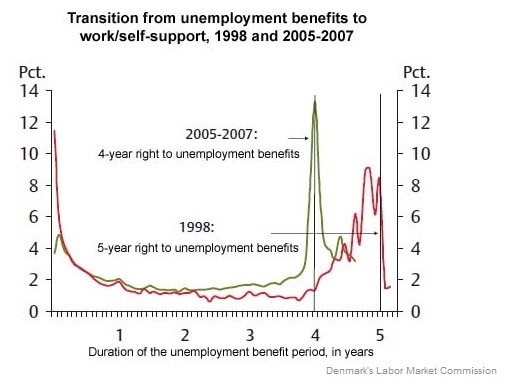 The red line shows the percent of the unemployed that found work when benefits lasted 5 years. The green line represents that same measure but when benefits lasted 4 years. In both cases the percent of people finding work spiked drastically as the benefits were set to end. While it may help people to sleep at night knowing they advocate extending unemployment benefits, it won’t help people find work. Or reduce the unemployment rate. This entry was posted in Economics, Economy, Politics: International, Politics: National and tagged Denmark, Liberal, Paul Krugman, Recession, Unemployment. Bookmark the permalink. Good article, and mostly fair. It is certainly nice to see someone validate their claims with statistical data. I’m getting mighty sick of listening to dogmatic hyperbole, regardless what political faction uses it. My question for you is what exactly do you think the government should do to stem this problem? I’m getting mighty sick of listening to dogmatic hyperbole, regardless what political faction uses it. what exactly do you think the government should do to stem this problem? 1. Move back the minimum wage to where it was 5 years ago. 2. End 99 weeks of unemployment benefits. Give 8 weeks notice. 3. Finalize the tax situation before going into 2011. 4. Stop this health care nonsense. Businesses are being forced to increase the cost of hiring someone. 5. Reduce the corporate tax. We currently are one of the highest taxed nations in the world. As a result, jobs will come back.